You may have heard about the couple who got married and for a wedding present received a beautiful chest of drawers. When they returned home from their honeymoon, the groom noticed a hidden drawer in the highboy. He asked his loving wife if he could use this drawer as his own and promise to him that she will never open it. Twenty-five years pass and she notices the hidden drawer is ajar. She peeks in and notices two golf balls and several hundred dollars. She asks her husband about the contents and he confesses, "Every time I was unfaithful to you I put a golf ball in the drawer." She says to herself, "well I guess it could have been worse...I'll forgive him for two times." "But, where did you get all that money?, she said. " He then fesses up, "every time the drawer got filled with a dozen golf balls, I cashed them in!" 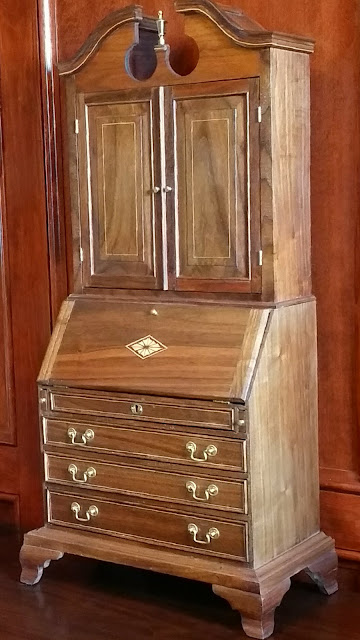 For 18th century Americans, the secretary desk or desk and bookcase served as the hub of their home. Books and papers were stored in the shelves, while personal possessions and documents were stored in the drawers. It might take months for letters to arrive, so many people would make a copy of the letter they sent and store it in one of the many pigeonholes so they would not forget what it was they had written about. Traditionally, the craftsmen who created these pieces installed a few hidden drawers as well to stash money and jewelry. The most common hidden compartment was hidden behind the small pilasters that flanked the small center door of the desk. After opening the small prospect door that was flanked by these pilasters, the inner box can be removed, which was often locked in place by a wooden spring lock. Another clever idea included sliding a block of wood out of the way to allow the rear panel to drop down which exposed small boxes in the rear. How about a modern Rube Goldberg-esque hidden drawer from Glen Huey (video). And finally, for the ultimate in furniture and hidden drawers, look at the works of Abraham and David Roentgen, whose furniture was both art and machine (video). Every now and then, people make the news for finding hidden treasures in their antique furniture. Here is a picture summary of the hidden compartments for the apprentice sized desk bookcase...without the golf balls. There is a video as well at the bottom of the page. With the sliding magnetic catch to the right, the secret drawer located behind this drawer is not engaged. With the sliding magnetic catch to the right, the secret drawer located behind this drawer is engaged. The metal square on the secret drawer is a piece of spring steel from an old saw that the magnet grabs on to. So remove your drawers (on that antique furniture)...you might discover a hidden treasure. Clever! Thanks for links to other secret places too.